Web OnCall gives you the ability to manage your on-call schedule online. You can can change and check your on-call schedule 24/7 from anywhere you have Internet access. 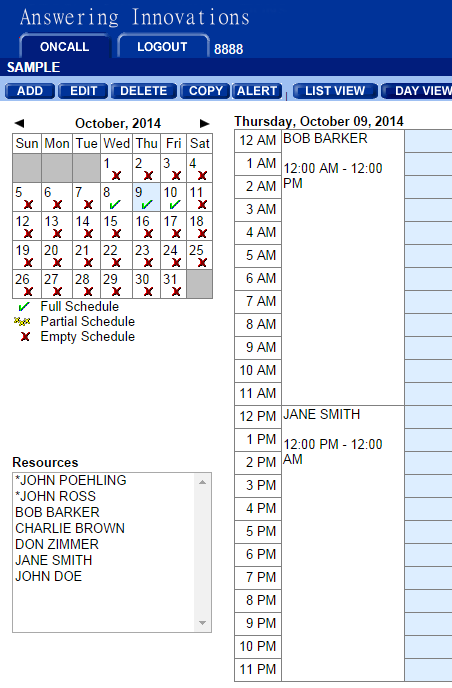 Web on-call scheduler access is included in all of our packages. Making changes to your on-call schedule is as easy. We provide a dedicated login and password that will give you secure access to your online schedule. Any changes you make to your schedule will update instantly in our system and will be available for all call center agents immediately. With Answering Innovations' Web OnCall, you can change, add, or delete your on-call staff instantly. You are in control of the accuracy of your online answering service account. As you enter your schedule into the computer, we will be able to access your most up-to-date data to better service your customers. Web OnCall is a much more efficient system, eliminating the need for offices to call or fax in any last-minute changes to the on-call schedule. We will always know who is on-call, and you will always feel confident that we have the latest information. No more emailing or faxing your changes to a middleperson at the answering service. On-call scheduling puts the control in your hands so you can change or update your schedule instantly through a secure web portal. Any updates you make to your on-call schedule are immediately available to our answering service agents. Since our system updates the moment you make a change, our operators always have the very latest information at their fingertips. Easily update your on-call schedule on any device with Internet access, such as your computer, smartphone, or tablet.